A Literary Odyssey: Book 24: Finished. I won't say that I hated it, but I can't say I liked it either. 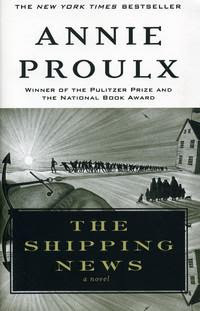 Quite honestly, I have nothing good to say about The Shipping News by Annie Proulx. Perhaps it is because I read it too quickly, thinking that if I kept going it would suddenly grab my attention. And while I find that there are a lot of things in the novel itself that I loved, the book left me feeling nothing. Perhaps I went into read this with the wrong frame of mind. Or, perhaps my mind has been spoiled by older classics that this felt too normal to me. I mean, part of the reason why I am reading the classics is that I really wanted to learn something from each and every book I picked up. Each of these 250 are seen as a classic for a certain reason and I want to know why. I just think that this modern classic left me feeling empty, where perhaps if I read it a few more years down the road, I could have appreciated it more. But let me talk more about the book and leave your own mind to determining whether this is a worthy read or not. Like I said in yesterday's post, The Shipping News is about a man named Quoyle, who is a newspaper man almost by accident. After the death of his wife, his crazy aunt comes to visit and convinced him to move with her and his two daughters to Newfoundland, the land of his ancestors. He agrees and they go. Once they are back, Quoyle lands a job working for a crazy newspaper run by a random grouping of men. At the same time that Quoyle is trying to learn that his wife really was a little crazy (and horrid to him), his daughter is also coming to terms with the meaning of life and death. As they both heal, they move on with their lives. It really is a touching story and I do admire the writing style. Proulx turns this big man, who is described as a big, unattractive man, into someone I actually began to like at the end of the novel. The daughters are also wonderful, but the men at the newspaper stole the show. I loved their personalities and the focus of the newspaper as a whole (most of the paper was comprised of the darker side of news-sexual abuse stories, car wrecks, etc). I also loved that Quoyle eventually came into his own as a writer and really turned his portion of the newspaper, the shipping news, into something extraordinary. The history of Newfoundland was also well done. It is a part of the world I hadn't given much thought to, or hadn't learned about in school. Unfortunately a history degree these days doesn't account for much, as there are large parts of world history I know nothing about. Proulx gave the history of the people life by integrating it as oral history in the eyes of the older characters. It was their history and it felt very real as I was reading it. It was well done. So why do I feel no connection to the book? I felt that the ending fell flat. I didn't like her little twist at the end, or how everything wrapped up so easily. In my opinion, the ending didn't fit with my own interpretation of the characters' lives and I was disappointed. It also took me a long time to warm up to Quoyle. In the beginning, it felt like he had no personality and was a "no one." I couldn't picture him in my head and I couldn't understand him or his decisions. That was frustrating for me, especially since I generally warm up to characters and scenes rather quickly. In all, I think that this is a book I will have to read again, once I have more distance from it. I often say that there is a right and a wrong time for each book we read. I think that is why some times I cannot always get into a book-it is just not right for that moment or where I am in my life. So yes, I will try this again, along with some of the other books I have felt this way about. Perhaps more life perspective and experiences is what I need. Anyway, I must move on to bigger and better things (hopefully). I read this a few years ago and mostly because parts of the movie was being filmed in my province. I felt a lot like you did: didn't hate it, didn't love it either. Well, I suppose I'll scratch this one off my list.